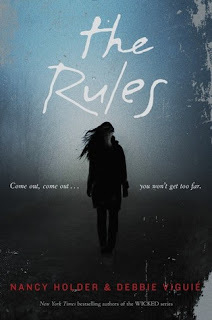 Nancy Holder and Debbie Viguie's The Rules took me back to my days of reading Christopher Pike novels on the beach all summer long. This is a trashy popcorn read that is self-described as a mix of "Saw" and "I Know What You Did Last Summer." That's an apt description for a book about wealthy teens getting killed off in ways that relate to their various flaws and vices. One problem I had was the multiple perspectives made it difficult to keep track of the characters. Luckily, they were all massive stereotypes, so I just had to check the list in my head, "Is that the 'roid rage jock, the all-star athlete, or the druggy band member?" The characters weren't well-written enough to get attached to them, so it was easy to watch their gruesome deaths and wait to see who the actual killer is. It's not a great book, but it hooks you in and I can see it being popular with developing readers who want some light horror.